The town of Townsend – “on the quiet side of the Smokies” – offers its annual winter festival, Smoky Mountain Snowdown, January 26-29, 2017. The festival features live music, lots of food including a Chili Cook off, expert history of the area presented in tales and tunes, as well as arts & crafts from the local artisan community as it shows some of its best moves. Townsend for many people is the gateway to Cades Cove, and this festival is a celebration of the heritage and natural beauty of Great Smoky Mountains National Park, and especially of Cades Cove, rich in history and lore. Music and art will demonstrate East Tennessee culture, deep and old and yet completely modern and present. Snowdown includes cast iron cooking lessons – with a country breakfast as a reward – a chili cook off contest, food and wine pairings as well as beer, bourbon and chocolate tastings! There’s a Singers and Songwriters in the Round event, banjo picking and beginning dulcimer lessons (on handmade dulcimers), teachings in the skills of needle felting (making wool stand out in 3D), quilting, watercolor painting, and even how to tie a fly for fly fishing – an essential skill for those who want to fish the numerous waters of the national park. The opening reception on Thursday, January 26 kicks off at 4 pm with live music, refreshments, and previews of the many food offerings to come. Saturday, January 28 is the day of both the chili cook off and the cast iron cooking extravaganza, so come hungry on that day! Members of the Townsend Artisan Guild will present their works and offer demonstrations of technique and lessons in skills. Learn about and view artworks of encaustic painting (hot wax painting), custom carving and woodworking, photography, fine arts painting, graphic art, glass and jewelry making, sculpture and clay pottery, and fabrics, clothing and natural fiber art. The Cades Cove Preservation Association provides expert views of the area with historians every day telling their tales and providing insight into this special part of the Smokies. Cades Cove is a favorite place for millions of visitors to the area, and this is a chance to learn more about the Association and its free Cades Cove Museum in the historic Thompson-Brown House – it’s a great time to become a member and support the Cove. Townsend is to the west of Pigeon Forge, reached through Wears Valley road, Hwy 321. Many people enjoy this end of things, removed from the bustle of Gatlinburg and Pigeon Forge. 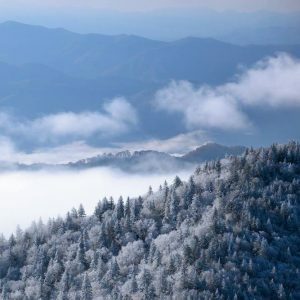 The views of the Smoky Mountains are spectacular from here, and our Wears Valley Cabins are highly sought after for a more peaceful visit to the Smokies. Also see our Guide to Cades Cove. For more information on the festival, check the Smoky Mountain Snowdown website and also the Facebook page.